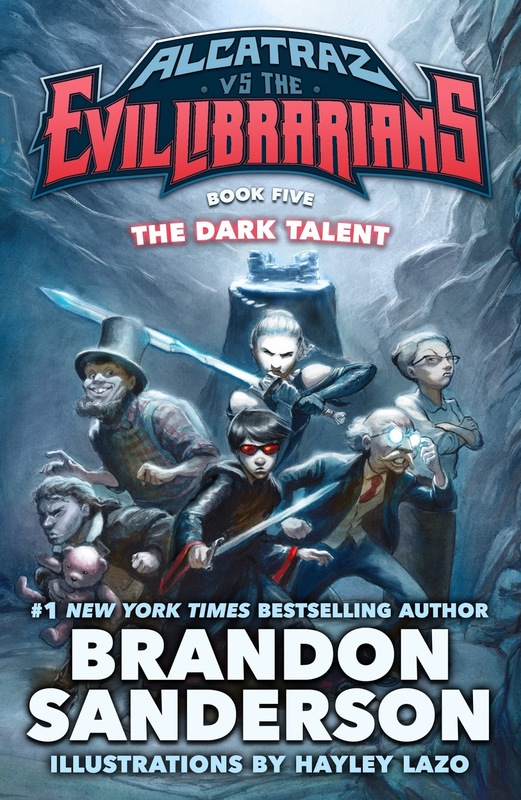 About the Book: (from publisher) The Dark Talent is the fifth action-packed fantasy adventure in the Alcatraz vs. the Evil Librarians series for young readers by the #1 New York Times bestselling author Brandon Sanderson. This never-before-published, fast-paced, and funny novel is now available in a deluxe hardcover edition, illustrated by Hayley Lazo. to save Bastille and defeat the Evil Librarians once and for all? GreenBeanTeenQueen Says: I am so, so, very excited about this book release everyone! About nine years ago, not long after I first started working in the library, I came across a new book called Alcatraz Vs the Evil Librarians. I was looking for books for tween readers, especially books to suggest after Harry Potter, and this one just sounded so fun-a boy who has a talent of breaking things, a grandfather who shows up late to everything, and librarians who have an evil plot to take over the world? I couldn't resist. I read the first Alcatraz book and I loved it. In fact, you can read my original review of Alcatraz Vs the Evil Librarians I posted not long after I started this blog! Since then, this series has been one of my go-to suggestions for tween and adult readers looking for a great series. I suggest it when they're looking for humor, fantasy, or just a good book. It's especially great as a family read aloud-there's something for everyone and I can really pull in adult readers with the fact that many are familiar with Brandon Sanderson's adult fantasy titles. My patrons and I have been anxiously awaiting the release of the fifth book in the series-book one starts with an epic opening preview that we haven't gotten to see yet. I am so glad Tor Books was able to release all five of the Alcatraz series in beautiful new hardcover editions that are illustrated. I can't keep these books on my library shelf and I love having these new editions to hand to patrons.